AQUARIUM OF THE PACIFIC HOSTS NOAA DAY ON SATURDAY, NOVEMBER 12, 2016: Discover how NOAA uses cutting-edge research to warn of dangerous weather, chart seas, conserve and manage marine resources, and better understand our environment. AQUARIUM OF THE PACIFIC HOSTS NOAA DAY ON SATURDAY, NOVEMBER 12, 2016 Discover how NOAA uses cutting-edge research to warn of dangerous weather, chart seas, conserve and manage marine resources, and better understand our environment. Find out how NOAA enriches life through science, from the surface of the sun to the depths of the ocean floor, to keep people informed of the changing environment around them and how to get involved. and try on a survival suit and respond to a mock oil spill. The public can talk in person with marine biologists and oceanographers while they learn about ocean habitat conservation, weather warnings, safe and sustainable seafood, ocean exploration, marine mammal strandings, and endangered species. Learn more about NOAA and its efforts to protect the ocean, predict changes in the atmosphere, provide information about climate change, and impact everyday lives of people through science, service, and stewardship at the Aquarium during NOAA Day. 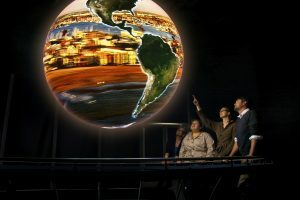 In addition, representatives from NOAA’s National Weather Service will use the state-of-the-art technology NOAA Science on a Sphere®, located in the Aquarium’s Ocean Science Center, to visually demonstrate our weather and climate in near-real-time using satellite data, prediction models, and other data. WHEN: Saturday, November 12, 2016, from 9:00 a.m. to 5:00 p.m. COST: Included with general admission: $28.95 adult (12+), $25.95 senior (62+), $14.95 child (3-11), and free for children under age three and Aquarium members. NOAA: NOAA’s mission is to understand and predict changes in the Earth’s environment from the depths of the ocean to the surface of the sun and to conserve and manage our coastal and marine resources. For more about NOAA visit http://www.noaa.gov/ or facebook.com/NOAA. AQUARIUM: The nonprofit Aquarium of the Pacific is a community gathering place where diverse cultures and the arts are celebrated and where important challenges facing our planet are explored by scientists, policymakers, and stakeholders in search of sustainable solutions. Programs for adults include Aquatic Academy evening courses in current ocean issues, the ongoing Guest Speaker Series, and visual and performing arts events. The Aquarium is dedicated to conserving and building nature and nature’s services by building the interactions between and among peoples. Home to more than 11,000 animals, Aquarium exhibits include the Molina Animal Care Center, Shark Lagoon, and Horses and Dragons and Vanishing Animals exhibits. Beyond its animal exhibits, the Aquarium offers educational programs for people of all ages, from hands-on activities to lectures by leading scientists. The Aquarium has won a 2015 Travelers’ Choice Award for Aquariums, as awarded by TripAdvisor® travelers. The Aquarium offers memberships with unlimited FREE admission for 12 months, VIP Entrance, and other special benefits.